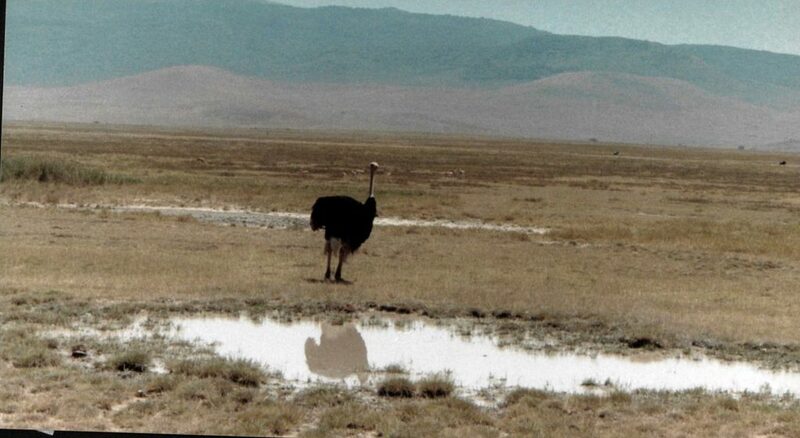 I have always found the Ostrich to be a curious bird, not one to stick its head in the sand. These birds generally move along in a stately manner even as they cover much ground in a short amount of time. A male and female with ten chicks in between them, moved as one horizontal line with the parents moving slowly and the chicks taking many quick steps. Then there was a male twirling in a graceful mating dance. At a closer distance than I would have liked, two females engaged in a nasty fight. 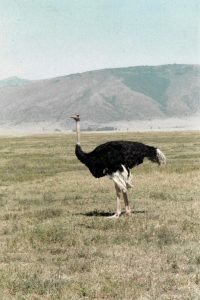 The ostrich is a bird that is best treated with respect. I was careful not to take sides. For “Amazing Facts about the Ostrich,” click HERE. Curiously, the Ostrich is not related to the Giraffe though both have big eyes!